The Historic Centre of Saint Petersburg and Related Groups of Monuments has a planned urban design with many baroque and neo-classical monumental buildings. The shape of the city was developed by Peter the Great during the 18th century. In communist times, it was officially renamed in Leningrad. Among the "related group of monuments" mentioned above is the Peter and Paul Fortress. This was the first project taken up by Czar Peter, and he moulded it after architecture he had seen in the Netherlands. 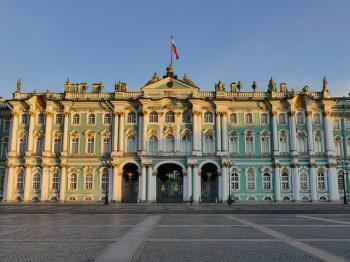 The magnificent Hermitage (Winter Palace) is also in St. Petersburg. It's one of the best museums in the world, and the collection has both volume and quality. St. Petersburg appeared to have more in common with its Scandinavian neighbours than Moscow. They were proud of that too: during my 2 week trip the Russian guide kept telling us "Wait til we get to St. Petersburg, its the best of Russia's big cities". Actually, when we finally got there after Moscow and Kiew I didn't totally agree. I found it to be cold (in the psychological sense of the word). It also definitely is a harbour city, so you must like water and watching ships (I don't). Besides the stunning Hermitage I visited the house where Pushkin used to live. It was a solemn expedition: the man was an icon in Russia. The second capital of Russia could not be more different from the official one. The commercial gloss and modernity of Moscow gives way to the historic tarnish and culture of Saint Petersburg. This is not to say that the city is not impressive or beautiful, quite the opposite, as the lack of a gleam allows for a certain charm and cosiness which money can't always provide. 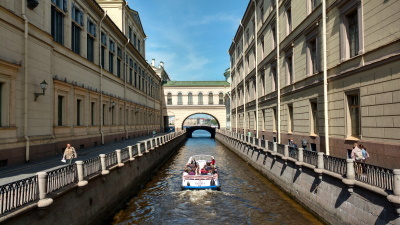 Despite having been designed as the imperial city with its many palaces, squares and avenues, Saint Petersburg is replete with a variety of lesser-known communal places, hidden in the courtyards, narrow alleyways and behind the deceptive storefronts. 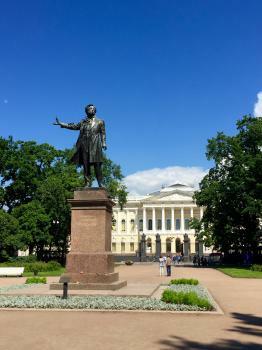 Saint Petersburg is paramount to the development of the Russian history. The seat of Peter and Catherine (both the Greats, but each in their own individual way), the starting point of the Bolshevik revolution, the site of the most brutal siege during the Second World War, the city is a treasure trove of historical and cultural artifacts, as each new turn reveals a residence of a famous writer or a beautiful building or a shady waterway. There are simply too many places of interest to list them all, and one simply has to allow themselves time to comprehensively experience the city. Chances are that if time is not exactly a limit on your trip to Saint Petersburg, then the money will soon become. Saint Petersburg is not a cheap city to experience with accommodations, food and entrances to the museums quickly adding up. The regular 700-ruble ticket to Hermitage is almost not worth it, unless you are quite happy to spend several hours waiting in line. Instead, splash on the online ticket, catering to the impatient tourists, and skip the line. I visited Saint Petersburg for 4 days in September 2017. Having visited Moscow last year it was quite easy for me to compare both cities and both are interesting cities to visit. Both cities are in my top 200 WHS and they didn't disappoint. It's easier to cover the historic centre of Saint Petersburg on foot and overall I felt it has a much more European feel with several churches, palaces, monasteries and cathedrals with European architecture and just a handful of onion-domed ones. The baroque exterior of the hermitage/winter palace (photo) is as striking as it's never-ending interior and its location in the palace square and on the Neva river bank is exquisite. The canal, fairway and drawbridge boat tour is a very pleasant way to explore the historic centre and beyond. A stroll to the Peter and Paul Fortress (incredible drone or Google Earth view) is a must and apart from the panoramic view of the Neva river and overall lack of high-rise buildings, here you will find the UNESCO inscription plaque. Vasilievsky Island is the maritime heart of the city. The exterior of the Church of the Savior on Spilled Blood is less colourful and extravagant than St Basil's Cathedral in Moscow but its mosaic interior more than make up for this. On separate half day bus/ferry trips I also visited the Peterhof Palace and Gardens often referred to as the Russian Versailles. My favourite highlights here were the Portrait Room and the lovely fountains with golden statuettes. In a way it reminded me more of Potsdam than Versailles. The rococo Catherine's Palace in Tsarskoye Selo, Pushkin is some 30km from St Petersburg and its interior is over-the-top with the highlight being the amber room. Even though I have visited several palaces worldwide, I'm glad I put some extra effort into visiting these two Russian palaces together with the hermitage. I would recommend separate visits of St Petersburg and Moscow as they can be quite tiring and repetitive if taken in together. Moreover both cities have worthwhile nearby WHS which would be mere stopovers if both large cities are combined in one trip. Every time I met and talked to Russians, they always praised the beauty of St. Petersburg, and that really made me wanted to see this city which was once the capital of Russian Empire. In the late evening, by the long distance bus from Novgorod, the city of St. Petersburg welcomed me with heavy snow, after managed to take subway to city center, I still had to struck at the subway station entrance for two hours because it was almost impossible to go and find my hotel, so my first day in St. Petersburg was totally white. However in the next day morning all snow had gone, I decided to walk to the famous Hermitage. After walked through the ceremonial arch gate, the vast winter palace square was absolutely breathtaking. After see gorgeous collections of Hermitage, and its equally impressive interior design, I continued my trip to Saint Isaac Cathedral to see its imposing golden dome and then Peter and Paul Fortress which I was impressed with the scenery of the city from the fortress wall, before back to Church of the Savior of Blood which was the only Russian architecture in this very European town. The next day I went to Peterhof Palace and Katherine Palace, there two palaces are located outside the city; I need to take train and bus to reach both places. The two palaces were unbelievable with theirs lavish decoration which easily made all European palaces in shame. I never saw too many chandeliers, fresco, golden baroque and rococo stucco, marble and amber crammed in such small rooms likes these places before. Also its gardens were impressive even in winter, sadly that I had no chance to see Peterhof's famous cascade in its glory as it was closed in winter. After palaces I spent my time in the famous Nevsky Prospect Street to see many city landmarks such as Kazan Cathedral which really made me feel that I was in Germany! St. Petersburg turned out to be a very beautiful city with many grand buildings and impressive landmarks; I also enjoyed Russian food a lot from many lovely restaurants near Nevsky Prospect. However in my opinion St. Petersburg did not have a Russian charm liked Moscow or Novgorod, maybe the city was very European and lack of many fanciful of Russian unique architecture which was my ideal Russian style, but this was a true intention of the city founder, Tsar Peter the Great who want this city to be very European, and from my experience he did very well and his dream was still lingered in the air of this city. All in all, St. Petersburg was another must see World Heritage Site. We enjoyed two days in S. Petersburg and wished we had more time. The museums have already been mentioned by other reviews we heartily agree with the positive comments about the Hermitage. We had a chance to travel by subway, which is a world all by itself, just don't try to take photos, the police do not allow it. We also visited the Kuznechny Market which was really fun. The vendors try to sell piles of unusual things and foods we had no name for. It was difficult to get rubles because there are few places to exchange currency. One of the most interesting places we saw was the Church of Our Savior on the Spilled Blood just a block off the Nevsky Prospekt. There is a great open air market on the square behind the cathedral where you can buy Russian "stuff". Just be aware that what looks like traditional Russian crafts are most likely mass produced someplace else. A walk along the Nevsky Prospekt was really fun. You will see the great train station, Kazan Cathedral, and other grand buildings. Our favorite thing aside from the museums was the canal boat ride through the city and along the river. We were warned not to get off the main streets as it was not safe for tourists and that people had no time for tourists. Our experience was that people were eager to try out their English and were helpful and friendly. I agree that The Hermitage is one of the best museums in the world. If you are visiting St. Petersburg, put aside one day to visit it. On my last day in the city (then Leningrad), which was also my last day in the country, I got lost with 2 friends from my group. We were in a panic, as the rest of our group was waiting for us at our hotel, preparing to leave for the airport. I will never forget that a young Russian man helped us get back on the right bus back to our hotel. We were so grateful that we tried to offer him some money but he refused and was rather amused by how appreciative we were. We barely made it back to the hotel on time! The Neva is about 500 m wide and that sets the size of everything. I did not rent a cycle but that could be a good idea if you want to come out from the centre for a while. Don't miss the Heremitage, Peterhof, Peter-Paul fortress and the artillery museum. The canal boats gives nice wievs but it seems to be hard to find someone giving service in other languages than Russian. The hard problem to find service in other language than Russian is a general problem. If you are in to military history, try to get out to Kronstadt which now can be visited by foreigners. Be there in the summer! The streets does not seem to have lights except in the very centre. It is dark in the winter but lovely in the summer. The white nights are really existing. English garden: Pavlovsk Palace "Pavlovsk is well worth visiting both for the treasures in the elegant palace and for the charming, rambling park, which is one of the largest and finest English-style landscape gardens outside the UK. " (From www.saint-petersburg.com/pavlovsk/index.asp ) AND Peterhof "Catherine the Great oversaw the creation of the first landscape garden at Peterhof, the English Park, which was designed jointly by English landscaper James Meders and the great Italian architect Giacomo Quarenghi. The park was once the setting for Quarenghi's English Palace, considered one of the finest works of Russian classicism, which was later used as a guesthouse for foreign visitors, and then destroyed by artillery fire in the Second World War. " Monumental Monoliths: The plinth of the statue of the Bronze Horseman (Peter the Great) ? known as the ?Thunder Stone?. It is thought to have weighed 1500 tonnes prior to final carving when moved the 6 miles from the quarry to a barge on the Gulf of Bothnia and on to St Petersburg in 1768-70. Domes: St. Isaac's Cathedral, built 1842, with a cast iron dome nearly 26 meters wide. Equestrian Statues: The "Bronze Horseman" of Peter I was commissioned by Catherine and stands on a pedestal known as the "Thunder Stone" which has been claimed to be the largest single stone "ever moved by man". The bronze Monument to Nicolas I in front of St Isaacs Cathedral "Unveiled on July 7th 1859, the statue was a technical wonder of its time; it spans six meters and was the first equestrian statue in the world with merely two support points (the rear hoofs of the horse) " (Wiki - http://en.wikipedia.org/wiki/Monument_to_Nicholas_I ) . The Bronze horseman also stands on just 2 legs but its tail provides further support! 'Threatened' by Dams: St. Petersburg (Northern Forts of Kronstadt) by the Saint Petersburg Dam Project. Diplomatic Missions of Joseon Envoy Min Yonghwan: 9 June 1896 (Lunar date: 28/4. Russian date: 28/5) Clear with slight rain later. "The area of this city is more than a hundred leagues. The population is over a million. The streets and buildings are large and magnificent. The River Neva encircles the whole city, and the imperial palace stands by the river. Each government building and all the schools are laid out in an orderly, symmetrical way. The design is excellent. It is truly an outstanding city." 14 July 1896 (Lunar date: 4/6. Russian date: 2/7) Clear weather. "At 2:00 P. M. we arrived at Peterhof after travelling 140 leagues. Two carriages from the Imperial household were already waiting for us. The ceremonial official accompanied us to the grand imperial palace. At that time the emperor was in the small imperial palace (Alexander palace).. In front of the grand imperial palace there is a water course on three sides-east, south, and north. In it there are several fountains of all kinds." 20 July 1896 (Lunar date: 10/6. Russian date 8/7) Clear weather. "At 8:00 A.M. Admiral Huosudov invited us to go to the estuary gun batteries. We left the River Neva on a steamship. This ship belongs to the Imperial Household and is very luxurious and comfortable. We travelled toward the southwest for 140 leagues and arrived at Kronstadt harbor. There were village dwellings all in a row and ships.. masts bristling like a forest. In the middle of the sea on the left and right at regular intervals were gun batteries. There were also gun emplacements on the nearby mountains, which were guarded by soldiers. There was a test-firing of several guns. Their sound rumbled and exploded like thunder. This newly founded city will expand and later become impregnably strong." 31 July 1896 (Lunar date: 21/6. Russian date: 19/7) Clear weather. "At 7:00 P.M. I went together with Planson to Kolpino (more than 30 leagues distant from here). There is a round observatory building there with four or five telescopes. The roof is covered with glass, which opens and shuts so that you can see things magnified 250 to 260 times"
Been part of independent Finland (de facto): The former Finnish municipalities mentioned below were a part of independent Finland until 1939 (de facto) (or 1940 [de jure]) when Soviet Union occupied them. Finland occupied the areas back a Continuation War but Soviet Union occupied them again in 1944. 540-025e Sestroretsky Razliv is half former Finnish municipality of Siestarjoki and half part of the areas that Finland occupied at Continuation War. Mints: The Peter and Paul fortress: "Other structures inside the fortress include the still functioning mint building (constructed to Antonia Porta's designs under Emperor Paul)"
Protective engineering works against flooding: A 25km long dam ("Flood Prevention Facility complex") has been under construction since 1980 (but was delayed for 15 years after the fall of the USSR and restarted in 2003). The Dam passes through the inscribed sites of Northern Forts of Kronstadt - and has indeed led to the destruction of parts of them. Zero Meridians: The "Pulkovo Meridian" was the base point for all geographical maps of Russia. It ran through the main hall of the Pulkovo Observatory. Gilded Lacquer or Urushi: Lacquer Study Room with gilded lacquer at Monplaisir, part of Peterhof Palace. Artificial Islands: 540-003b12 Fort Alexander I -- and also Tolbukhin Island - "The lighthouse is situated on a small artificial island 3 miles west of the Kotlin island.". Visited by Alexander von Humboldt on his travels: He was in St Petersburg in May 1829 (on his expedition to Siberia) and was treated as a personal guest by the Tsar. Queens and Empresses: Catherine Palace, built by Empress Elizabeth (1741 - 1762) and Empress Catherine II the Great (1762 - 1796). Naser ed-Din Shah: "Of the things frequently seen in Russia were the abundance of carriages in (St.) Peter(sburg), many tramways of iron in the streets, and also many beautiful dogs, large and small"
Holy Tunic: Fragments of the Robe were held in the Sts Peter and Paul Cathedral and the Grand Church of the Winter Palace (consecrated as a Cathedral in 1763.). There is no mention of them being in either building today. Built in the 18th century: "the result of a vast urban project begun in 1703 under Peter the Great"
Modelled after: Peterhof "Russian Versailles"